One warm summer’s day a fox was ambling along, enjoying the sunshine. He came across a vine. Juicy bunches of grapes were hanging from its branches, ripe and ready to be eaten. 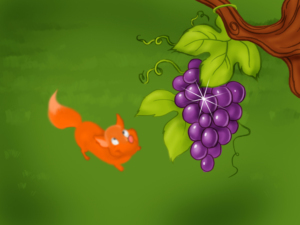 The fox was thirsty, so when he saw the grapes, he wanted to eat them right away. 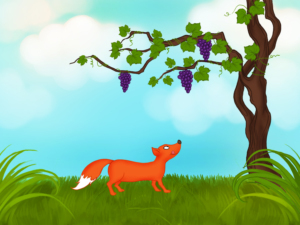 Walking back a few steps, the fox took a run up and jumped and almost reached the grapes. 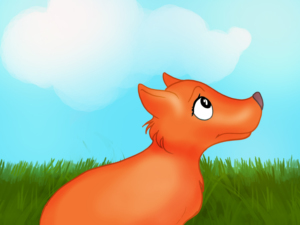 “I'll try again," the fox thought. 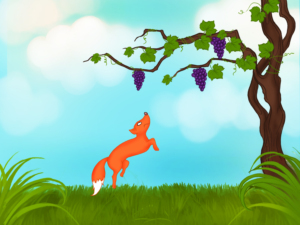 He took a few steps back, counted to three and ran and jumped again, but he still couldn't reach the grapes. 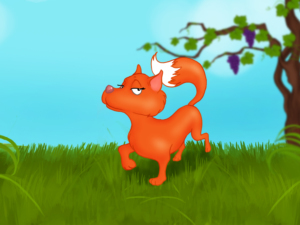 “Third time lucky!”, the fox said and jumped for a third time. But he still couldn't reach. He tried again and again until he became very tired and couldn’t jump any more. 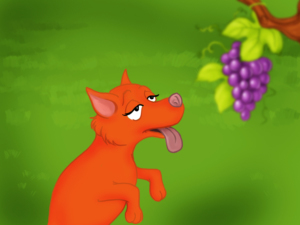 The fox thought for a while, put his nose in the air and said to himself, “Well, I’m sure the grapes were sour anyway!” It is not еasy to like what you cannot get.